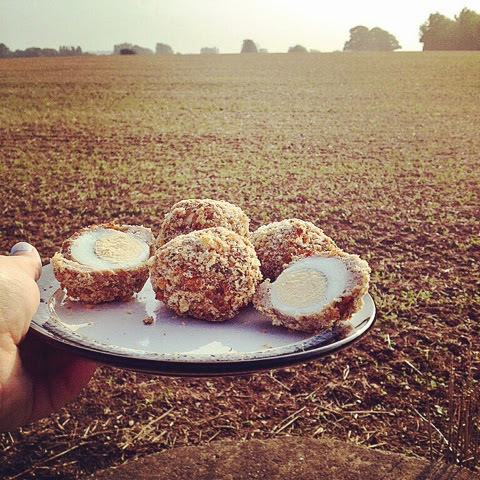 The not so humble Scotch egg is a stalwart picnic favourite and long gone is the day glow ,artificial sun tanned Scotch egg of old ,if you bake them yourselves. And oven baking means it is healthier , no longer will I eat a deep fried Scotch egg. I don't about you but I am clinging onto summer a little longer , there is no reason why we can't continue to picnic as Autumn tumbles in. 400g (14 oz) sausage meat I went with one that had black pepper and nutmeg in. Fine dried breadcrumbs combined with mixed herbs. Divide your sausage meat into 6 sections. Cover each egg in turn with the sausage meat ensuring that there at no gaps. Rolls the sausage meat covered egg so you achieve a nice round shape. 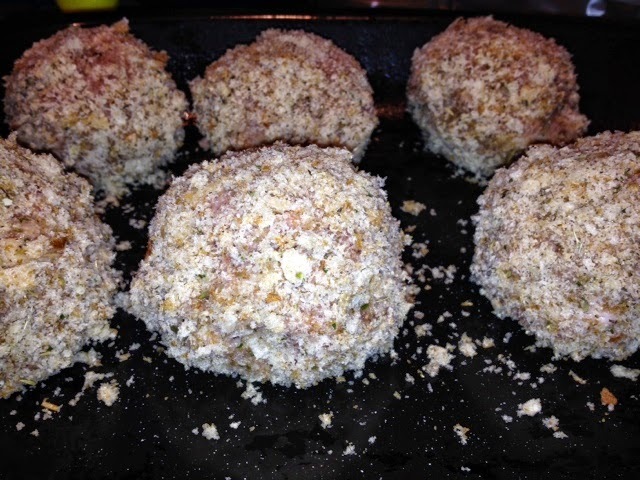 After this is down roll them in bread crumbs and place upon a baking tray. And cook for around 25 minutes adjust this depends on the thickness of the sausage meat. I read a tip which was to put a cocktail stick through them to stop them rolling about tin the oven. Ideal for taking on a picnic just so happens I eat mine in my office , though my office just so happens to be a field. I've been meaning to make fennel & sausage rolls for a while so I'll add this to my list once my oven is up and running! Best office ever! Wow, never thought of making something like this! Great idea! I've never had a scotch egg- sure homemade ones taste far superior! My son is a major scotch egg fiend. I think we would save a fortune making our own! Those look delicious - I always wondered how you make scotch eggs! I love Scotch Eggs and haven't had one in ages! I know my daughter would love this as well. Would be nice for me to do a veggie one. Perfect little snack. I totally adore home made scotch eggs! I love scotch eggs, never tried making my own, always assumed they needed deep frying or something so may give it a go now I know they work in the oven. I will be honest, never had a scotch egg in my life. Your baked ones could just about make me try one. Wow that's amazing you made your own - doesn't sound too complicated either! I've never had a scotch egg, these look really njce! I love baked scotch egg, what a beautiful presentation!